The ANIMAL ARCHITECTURE project is launched as an exhibition in 2013. The most impressive photos are displayed in the form of large-format art prints in high-quality reproductions. The exhibition is superbly equipped with 65 large-format pictures and explanatory plaques. 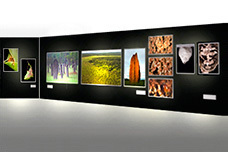 All pictures are produced on KAPA®plast material (very light and stable) having a slim aluminum frame In addition to the outstanding visual quality of the exhibition, the visitor will find lots of detailed information on the subject and the various animal species.